The combined annual benefits from all final rules exceed their costs by $32 billion to $142 billion a year. The benefit/cost ratio ranges from 4-to-1 to 22-to-1. The combined annual benefit s from four proposed rules examined here exceed their costs by $160 billion to $440 billion a year. The benefit/cost ratio ranges from 12-to-1 to 32-to-1. So there are job losses in some sectors and job gains in others. 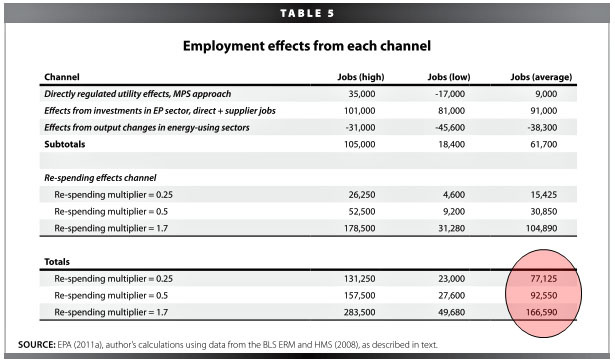 The middle estimate for the aggregate effect is +61,000 jobs. When you account for spending multipliers, the aggregate effect is somewhere between 77,000 and 166,000 jobs. Conservatives are hiding behind abstractions — job-killing big-government blah-blah — but don’t be fooled. They are not protecting “the economy” or “jobs.” They are protecting a specific set of polluting industries, at the expense of the public interest. Put that horsesh*t in any ideological serving dish you want. It still stinks.